Access, representation, and influence of Asian Pacific Americans and other racial, ethnic, and immigrant groups in American political, educational, and social institutions and sectors; the international political dimensions of minority group experiences; and public policy research focusing on poverty, race relations, and social justice. For more information or to contribute to the Don T. Nakanishi Award, please contact us or click here. DON T. NAKANISHI, Ph.D., was the Director Emeritus of the UCLA Asian American Studies Center, the largest and most renowned research and teaching institute in Asian American Studies in the nation, and Professor Emeritus of UCLA's departments of Asian American Studies and education. Prior to his retirement from UCLA in 2009 after a thirty-five year professorial career at the university (and the last twenty years also as Center Director), he provided leadership and vision for the national development of the fields of Asian American Studies and Race and Ethnic Relations Scholarship for four decades. Born and raised in the multiethnic, working class community of East Los Angeles, California, Professor Nakanishi attended Theodore Roosevelt High School, where he served as Student Body President. He was also selected as Boy Mayor of the City of Los Angeles when he was a senior. A political scientist, Professor Nakanishi received his B.A. in intensive political science from Yale University in 1971, and his Ph.D., also in political science, from Harvard University in 1978. Professor Nakanishi was a prolific writer and highly influential teacher and scholar, who has written over 100 books, articles, and reports on the political participation of Asian Pacific Americans and other ethnic and racial groups in American politics; educational research on issues of access and representation; and the international political dimensions of minority experiences. Among his many former students are faculty members at colleges and universities across the nation and world, award-winning writers and artists, and highly committed elected officials, community leaders and educators. Professor Nakanishi was widely recognized for developing the fields of Asian American political and educational research. He was the first to demonstrate that Asian Americans, despite their high group levels of education and income that are usually associated with active political participation, had very low levels of voter registration and voting. He also began in 1976 to compile lists of Asian American elected officials across the country, thereby launching the National Asian Pacific American Political Almanac, which is now in its 15th edition and has been touted as the "indispensable guide to Asian American politics." Two of his popular books -- Asian American Politics: Law, Participation, and Policy, which he co-authored with James Lai, and Asian American Educational Experience, which he co-authored with Tina Yamano Nishida - have served to capture and advance the study and teaching of Asian American political and educational research. Professor Nakanishi has received numerous awards for his scholarly achievements and public service, including the National Community Leadership Award from the Asian Pacific Institute for Congressional Studies (2007). the prestigious Yale Medal from Yale University (2008), the inaugural Engaged Scholar Award from the Association of Asian American Studies (2009), the inaugural Distinguished Educator Award from the Asian and Pacific Islander American Scholarship Foundation (2009), the Lifetime Achievement Award from the American Political Science Association, Division of Race, Ethnicity and Politics (2009), and the George Kiriyama Educational Excellence Award (2010). He also received lifetime achievement awards from the Los Angeles City Council, Los Angeles Board of Superviors, and the California State Assembly. 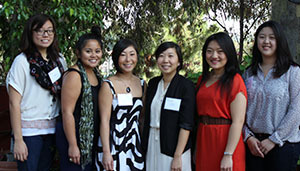 Upon his retirement from UCLA, faculty colleagues, alumni, students, donors, and friends also joined together to establish a special endowment at UCLA entitled, "Don T. Nakanishi Award for Outstanding Engaged Scholarship in Asian American & Pacific Islander Studies," which annually recognizes and provides cash awards to UCLA faculty and graduate students in Asian American Studies, who are pursuing outstanding community-based engaged research. 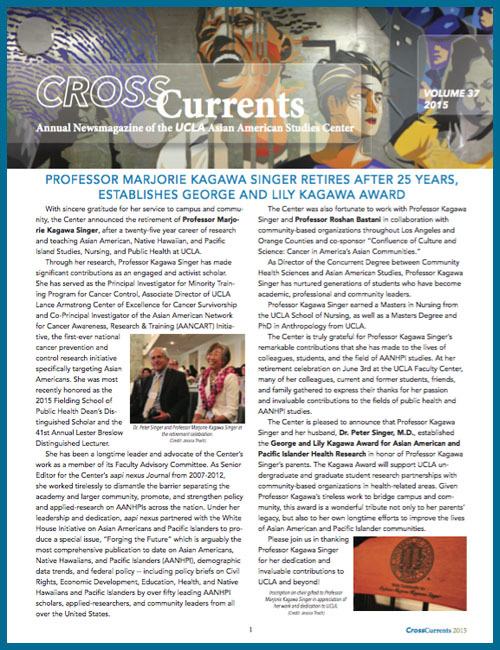 A former national president of the Association of Asian American Studies, Professor Nakanishi co-founded and served as publisher of Amerasia Journal, the top academic journal in the field of Asian American Studies, which was established in 1970, and more recently co-founded AAPI Nexus: Asian American and Pacific Islander Policy, Practice, and Community Research. Recently, A. Magazine identified him as one of the "100 Most Influential Asian Americans in the United States during the Decade of the 1990s," and the Smithsonian Institution appointed him to a 25-member national Blue Ribbon Commission to plan for the future of the Smithsonian during the 21st century. He also has been featured in a number of publications, including Nicholas Lemann's The Big Test: The Secret History of the American Meritocracy, which chronicles his undergraduate career at Yale University, and a special tribute issue of Amerasia Journal, "The Political World of Asian Americans," which was published in 2010. 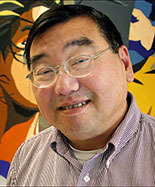 President Bill Clinton appointed Professor Nakanishi to the Civil Liberties Public Education Fund Board of Directors, which administered the nation- wide public education and research program that was established under the 1988 Civil Liberties Act that provided a national apology and reparations for the 120,000 Japanese Americans who were incarcerated in concentration camps during World War II. Both of Nakanishi's parents and older brother were among those who were interned. He also served on the seven-member Board of Transportation Commissioners for the City of Los Angeles during Mayor Thomas Bradley's administration. A well sought after speaker and media commentator, Professor Nakanishi has been a member of the board of directors for numerous national and local organizations, including the Poverty and Race Research Action Council, Board of Governors of the Association of Yale Alumni, Asian Pacific American Caucus of the American Political Science Association, Harvard University Graduate Alumni Council, Simon Wiesenthal Museum of Tolerance, Japanese American National Museum, the AT and T Universal Service Task Force, Asian American Justice Center, Nielsen Media Research, Western Justice Center, Beverly Hospital and AltaMed Health Care Services of East Los Angeles. The UCLA Asian American Studies Center, founded in 1969, is the largest, most comprehensive, and renowned research, teaching, publications, library and archival collecting, and public educational institute focusing on the Asian Pacific American population in the nation. It has over 40 tenure track faculty specialists in Asian American Studies; offers over 70 undergraduate and graduate courses which annually attract 3,000 students; publishes Amerasia Journal and AAPI Nexus and other books and publications; and has the largest and most significant library and archival collections in the field. It also maintains active partnerships with community based organizations, civil rights groups, museums, libraries, and elected officials throughout California, across the nation, and in other parts of the world. During Professor Nakanishi's directorship, the Center increased its endowment to over $6 million through generous gifts and donations from alumni and friends worldwide, including six endowed academic chairs. Professor Nakanishi is survived by his wife, Dr. Marsha Hirano-Nakanishi, who recently retired from the California State University system and his son, Thomas Nakanishi, who completed his graduate studies in public policy at Harvard University's Kennedy School of Government. "The State of Asian Pacific America," in The State of Asian Pacific America: Policy Issues to the Year 2020. Los Angeles: LEAP and UCLA Asian American Studies Center, 1993, pp. xiii-xiv. "Linkages and Boundaries: Twenty-Five Years of Asian American Studies," Amerasia Journal, Vol. 21, No. 3, 1995/1996, pp. xvii-xxv. With Andrew Aoki (eds). "Asian Americans and Politics," Special Symposium, PS (publication of the American Political Science Association), Vol. XXXIV, Number 3, September 2001, pp. 602-644. With Toyotomi Morimoto (eds) Ekkyo suru Tami to Kyoiku (Border Crossing People and Education). Kyoto: Akademia Shuppan-kai (Academia Press), 2007. 322 pp. (Book). With Russell Leong. L. Ling-chi Wang: The Quintessential Scholar- Activist. Amerasia Journal , Vol. 33, no. 1. 2007, (Journal, special issue). "Forward," in Christian Collet and Pei-te Lien (eds). The Transnational Politics of Asian Americans (Philadelphia: Temple University Press). 2009, pp. ix-xiv. "To Our Readers: Lessons from Asian Australia," Amerasia Journal, Vol. 36, no. 2, 2010, forthcoming. "From the Founding Publisher," Amerasia Journal, Vol. 37, no. 1, 2011. pp. vii-x. With James Lai (eds). National Asian Pacific American Political Almanac. 14th edition. Los Angeles: UCLA Asian American Studies Center Press, 2011. 260 pp. (Book). "Forward: Never Forget What Happened and Never Forget What Can Be Learned," in Aiko Herzig-Yoshinaga and Marjorie Lee (eds). Speaking Out for Personal Justice: Site Summaries of Testimonies and Witnesses Registry from the U.S. Commission on Wartime Relocation and Internment of Civilians Hearings, 1981). 2011. pp. xxi-xxiii. "Preface" Special Issue on "Neglected Legacies: Japanese American Women and the Redress/Reparations Movement," Pan-Japan, Vol. 7, Nos. 1-2, 2011, pp. i-iii. "Asian Americans," in Donald T. Critchlow and Philip Vandermeer (eds). The Oxford Encyclopedia of American Political and Legal History (New York: Oxford University Press. 2012. "Toransunashonaru na Nikkeijin: Iju, Kikan, Saitogo," Hiromi Yoshida (trans.) in Toyotomi Morimoto and Sachio Negawa (eds. ), Toransunashonaru na "Nikkeijin" no Kyoiku, Gengo, Bunka: Kako kara Mirai ni mukatte. Tokyo: Akashi Shoten, 2012, pp. 23-34. "Achieving Racial Convergence: A Leadership Challenge," in Chester Hartman (ed), America's Growing Inequality: The Impact of Poverty and Race. Lanham, MD: Lexington Books, 2014, pp. 35-36. With James Lai (eds). National Asian Pacific American Political Almanac. 14th edition. Los Angeles: UCLA Asian American Studies Center Press, 2014. 260 pp. (Book). "45 Years of Asian American Studies at Yale University," CUNY Forum, Vol. 3:1. 2015-16, pp. 33-42. "Amerasia Journal @ 45: More Than A Soliloquy," Amerasia Journal, Vol. 41, no. 3, 2015, pp. viii-xxi. Editor. Asian American Leadership: A Reference Guide. Santa Barbara: Mission Bell Media, 2015. 560s pp. (Book).